Your camp experience will include an extreme adventure on the high ropes course. A high ropes course is an obstacle course 30 feet in the air. You and other Voyageur Partners will build incredible bonds of trust and friendship. Your course experience will be unforgettable; you will leave camp with new confidence, lasting relationships, and deeper faith. We invite you to a camp week that will change your life. Come and work as a “counselor assistant” during a Voyageurs week. 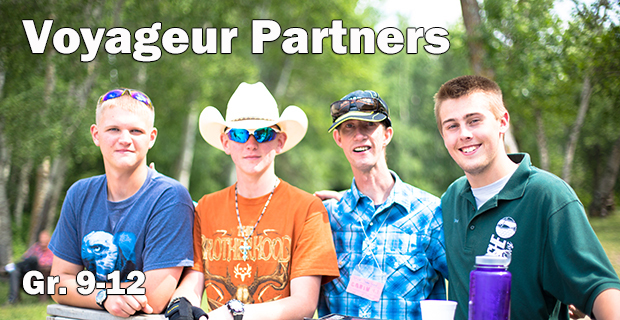 Voyageur campers are individuals (usually adults) with developmental and physical disabilities. “Voyageur Partners” spend the week caring for and guiding one to three campers under the direction of a trained counselor. In the evenings, there will be time for processing experiences, hanging out with new friends, and worship. We believe you will grow in your faith through the kind of radical love that is Voyageurs week. Camp begins at 5:00 pm on Sunday and concludes at 2:00 with a program on Friday.